Allen and I both suffer from serious allergies, which is quite unfortunate, because we live in Saint Louis (one of the allergy capitals of the U.S.), with 2 cats and 1 dog! Spring and fall, although beloved, can be exceptionally difficult in the Cavedine house. Allergies are, or course, irritating, but the sore throats that always seem to tag along with our sinus fun, are the real kicker! 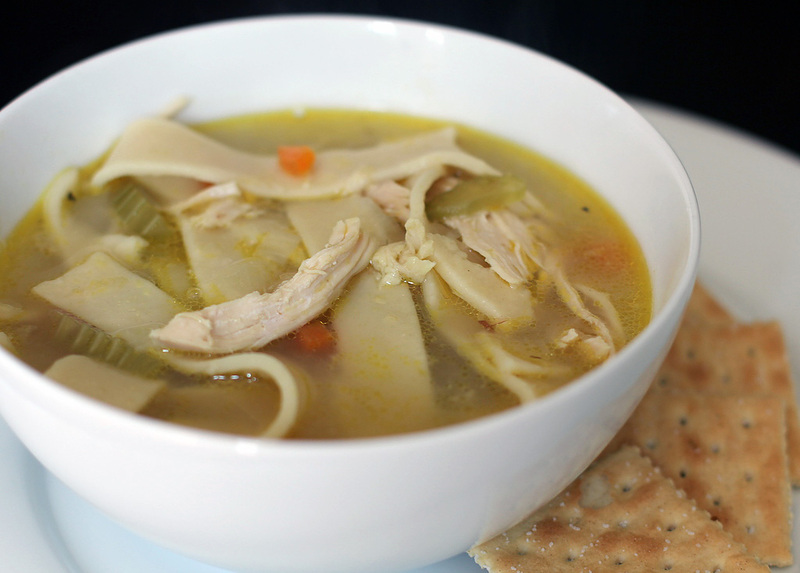 To combat the sinus funk, we created this a magic elixir to soothe the sorest of sinusy throats – an unbelievably easy and tasty semi-homemade chicken noodle soup. Although making a semi-homemade soup may sound like a terrible idea when you’re not feeling well, this one takes a few shortcuts to make it easier on the ill and trust me, it is worth it! 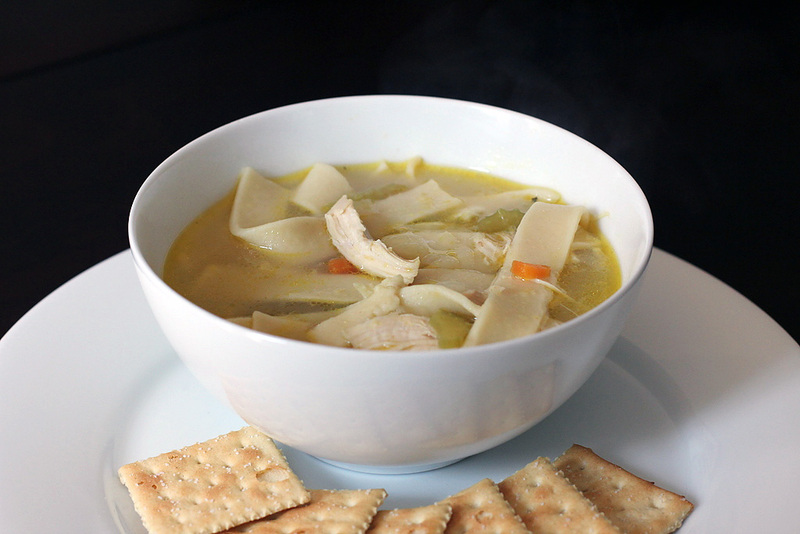 This addicting, comforting, hot, and salty soup will have you feeling up to snuff in no time! It also makes a ton, so you can freeze a few containers for the next time you need a hit. Confession of a *wannabe* foodie… I rarely use homemade chicken stock! If I have a chicken hanging out around the house, of course I will use the carcass to make a tasty broth, but… usually I stick with Penzey’s chicken base. AND… the ultimate foodie confession… I rarely taste a difference! Chop all your veggies (onion, carrots, celery), so they are about the same size. Pour the olive oil into a large soup pot over medium-high heat. Once the oil is hot, add the chopped veggies and smashed garlic. Saute until the veggies are soft and translucent. Add salt, pepper, and flour, and stir 3-4 minutes until the flour completely coats the veggies and begins to turn light brown. Add chicken stock, one cup at a time, whisking thoroughly between each cup (for the first 4-5 cups). As you bring the stock to a simmer, shred or cut the chicken into desire pieces. Add the shredded/chopped chicken and noodles to the pot. Simmer until the noodles are tender. Add salt and pepper as desired. Please e-mail me a sample! Just what the doctor ordered!!! Broaden out your diagnosis’ treatment menu and I could write a book or two! We can collaborate!! Maybe get it published in the New England Journal of Medicine. Here’s to your new blog!!! I am giving a bridal shower July 17th. Would you be interested in doing the sweets? Love your vergage and beautiful photots. The site looks great. Congratulations! wow, what a fantastic site!!!! Ciao Annie chronicles my confessions of a wannabe blogger, foodie, crafter, cake decorator, party planner and professional. My hope is that this blog will inspire both myself and others who love to put time and effort into crafting a creative life, but are somewhat limited by everyday restrictions like time, budget and way too many interests!